It is an honor to Introduce a growing concern. Growth has two aspects.Growth is a result of demand. Demand is a result of growing economy - Our National Economy. In the modern world, quality is the main conscious among the consumers. Every millers food grain processors are in the verge of modernizing their facility to produce quality products.color sorter is the very key aspect of modern mills. Setting up a color sorter was expensive and was possible only for those who afford that much since there was only option to import from foreign countries. To meet the great demand for color sorter in Indian market, we have designed and developed color sorter machine.Since the machine is designed, developed and manufactured locally, we could offer our color sorter in very affordable price range that every miller can modernize their facility with color sorter.considering the requirement of the millers in a color sorter machine,such as the required quality output,material rejection,maintenance,running coat,after sales service, we have fulfilled their need by offering the superior machine up to their satisfaction. Our Directors- Technical, Research & Design and quality test in charge are fully focused on one thing- Our products are customer friendly.Both at the time of erection and during regular usage. Our Service manager and his team have been trained to assist the customer by ensuring that our machines give useful service. our marketing director,Accounts manager,delivery section personal are available anytime for customer care. Our 130 team of staffs have been trained to work with customer satisfaction as the objective. It is an honor to state that we sold more than 4500 machines and in India and abroad like Myanmar, Nigeria, Sri Lanka & Malaysia.Our continuous research to improve the performance of our color sorter and our extensive field study towards we introduce our latest model "MARK JX 120 "series color sorter with Bichromatic CCD Duel color sensor technology suitable for Dhall,Grains,Beans & Pulses. 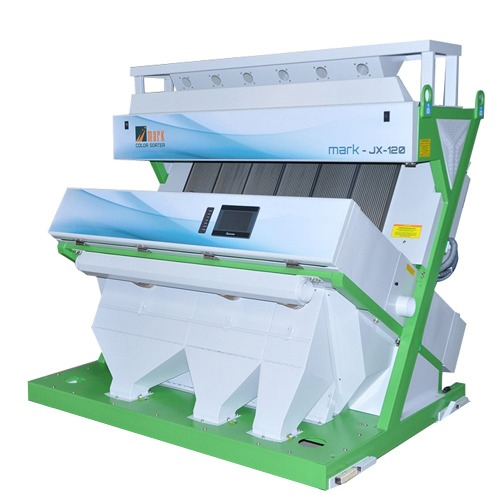 "mark" domestically first initiated CCD duel color sensor technology,5000 x 2 Pixel, realizes discolored area less than 0.068mm,applicable for different beans & nuts sorting solutions. Advance optical sorting room, specially made high speed ejector and high speed vision control arithmetic and communication protocol secures high sorting index. Based on touch screen operation manual,the operation interfaces is more human friendly.